Premium Flex Grip Gladhand Set - Sauber Mfg. Co.
06/20/2016 As a running change, we’ve upgraded our air brake systems to include flexible grips as indicated in the image. This is the HD version of FLEX-Grip which includes brass fittings and a robust, thermo-elastomeric construction that flexes with air lines during tight turns and makes connecting and disconnecting a snap. 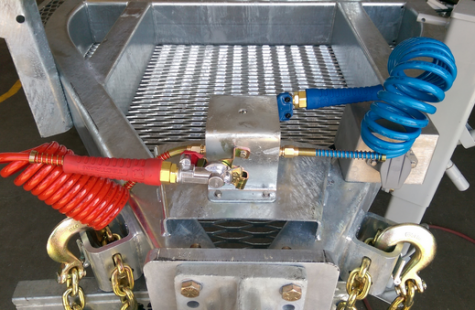 When air brakes are required, we automatically provide coil hoses, FLEX-Grips, gladhands, gladhand holders and connection protection. This difference is one of many little things that we’re doing to make your trailers the best ones you’ll ever own.